Google’s plans to build an ad blocker into its popular Chrome web browser could have a dramatic impact on each publisher’s monetization strategy. If the rumors are true, that is. According to the Wall Street Journal, this “ad-blocking feature, which could be switched on by default within Chrome, would filter out certain online ad types deemed to provide bad experiences for users as they move around the web”. While this feature is not confirmed, it could have a substantial impact on the ad-blocking threat to publishers. It’s not clear whether this integrated ad blocker would simply block certain ads or whether it would block all ads on a site if some ads are found to be unacceptable. Fortunately, there is some clarity about the categories of ads that may well be blocked. Google is a founder member of the Coalition for Better Ads that released a list of “least preferred ad experiences for desktop web and mobile web” that will almost certainly be targeted by the proposed ad blocker. In desktop browsers, these ad types include pop-up ads, auto-playing video ads with sound, prestitial ads with countdowns and large, sticky ads. The list of problematic ads on mobile devices is even longer. Each of these ad types have something in common. They tend to degrade the audience’s ad experience. Assuming Google will build an ad blocker into Chrome, here are five potential implications for publishers and the ad blocker trend. It seems counterintuitive that Google would make it easier for its users to block ads. After all, Google’s primary source of revenue is ad revenue and it is heavily invested in a substantial advertising infrastructure. Why would Google want to compromise its biggest revenue source by blocking its ads on publishers’ sites? Many publishers still rely on a relatively large quantity of ads and a variety of ad formats to maximize potential impressions. These publishers will probably be negatively affected if some of those ads are blocked by Chrome users, particularly considering that by December 2016, 11% of the global internet population was blocking ads on the web. When you consider that Google Chrome has a market share of almost 60% of the desktop browser market, it isn’t difficult to see why publishers are concerned about this prospect. On the other hand, publishers that monetize their sites using less offensive and less intrusive ad units will benefit from an increase of impressions as lower quality ad types are blocked and more ad inventory is made available. If this new feature does indeed reduce the need to download a third party ad blocker, publishers could see a significant increase in revenues. Ad quality overall will likely improve and higher revenues will follow. 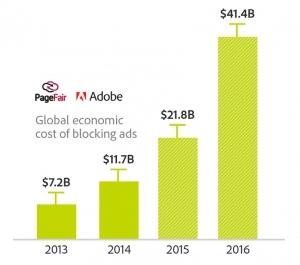 Chrome’s substantial market share could also mean trouble for third party ad blockers. Offering an ad blocker alternative that enhances the user experience, coupled with the so-called “tyranny of the default” could well mean that Google will squeeze many third party ad blockers out of the market by rendering them redundant. Many publishers are concerned about this. Ironically, narrowing the field could hamper publishers’ efforts to address the root causes of ad blocking by educating audiences about the need for ads to pay for high quality content and offering incentives not to block ads. While an integrated ad blocker will, essentially, set new quality standards for all Chrome users, Publishers will still need to adopt effective ad blocker strategies for other browser users. This both complicates publishers’ ad blocker strategies and potentially undermines their efforts so far. Still, this could be good news overall. This move could lead to fewer third party ad blockers that would otherwise block higher quality ad products. This translates into better website revenue for publishers and a positive user experience for audiences. Developing a smarter approach to low quality ads is also an important user retention strategy. One of the primary reasons why consumers resort to ad blocking is because of poor user experiences. Often this is the result of intrusive and offensive ad types that distract from the content the audience is most interested in. Another big contributing factor to a bad user experience is high latency caused by a dizzying array of ad trackers and other components of on-site advertising solutions. Slow site load times frustrate audiences and incentivize them to resort to using ad blockers or, even worse, stop visiting the publisher’s site altogether. Ars Technica, a popular technology publication, made a concerted effort to work with advertisers to reduce latency on its site when it redesigned its site last year. When Ars Technica shifted to a user-centric approach to its site re-design and eliminated the culprits responsible for the high latency its users were experiencing, it noticed a drop in ad blocker usage from 40% to 25%. Google’s ad blocker initiative could, similarly, persuade advertisers to optimize their tracking code and help publishers dramatically reduce site latency. The result could be a comparable reduction in ad blocker usage or, at the very least, a much more receptive market for the ads that remain and improved ad revenue for participating publishers and advertisers. In the search for ad types that audiences simply can’t ignore, publishers have historically resorted to more intrusive ad formats that include pop-ups, screen take-overs, timers and similar ad types to boldly captured their audience’s attention. If the rumors about Google’s ad blocker are true, most of these ad types will be blocked and the revenue earned from these ads will dry up. That isn’t necessarily a bad thing, though. As I mentioned above, these types of ads tend to create a negative ad experience. Blocking them will likely force publishers and advertisers to adopt better quality ads and, in the process, raise the bar for online advertising. The result will almost certainly be a markedly improved experience for audiences as advertisers and publishers place more emphasis on ad formats such as native, video and in-image advertising that offer more seamless ad experiences and greater relevance. As one US publisher told the WSJ, “It is great for premium publishers, as it will help to shut off the demand going toward low quality, highly intrusive inventory and shift the pre-roll market to entirely skippable ads”. Google’s position as a founding member of the Coalition for Better Ads means that it has considerable influence over decisions about which ad types are “preferable” and are likely to be blocked by a Chrome ad blocker. Much will depend on Google’s intentions. As one publishing executive said to Ad Age, “Google becomes the judge, jury and executioner”. Some publishers are also wondering if Google will use its position to push its AMP mobile format as the de facto standard publishing format. AMP has shown early success with many major publishers and offers audiences an improved reading experience. Regardless of your perspective, it is clear that building an ad blocker into the Chrome browser will have profound implications for the online advertising ecosystem as a whole. It will almost certainly force publishers to rethink their monetization strategies and shift their focus overwhelmingly to their audience’s preferences. This will likely mean stronger emphasis on ad formats such as native, in-image and video advertising that are less intrusive, more relevant and offer much better ad experiences, overall.